Albert Pope, born 1843 in Boston, visited the 1876 Centennial Exposition in Philadelphia, where he saw new two-wheeled contraptions on exhibit. He returned to Boston and started the Pope Manufacturing Company, the first American bicycle manufacturer, which later relocated to Hartford. 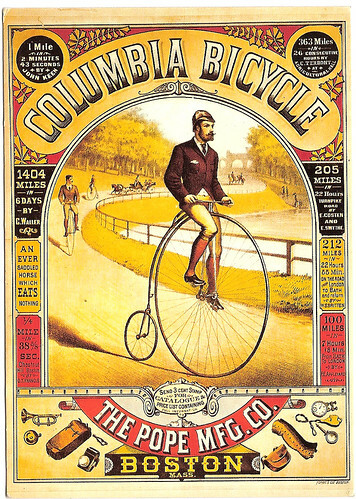 Pope turned out 60,000 bicycles a year by the 1890s. He also became a key sponsor of the League of American Wheelmen, which lobbied for better roads. This entry was posted in Images, Science&Tech and tagged Albert Pope, Bicycle, Hartford. Bookmark the permalink.